In the DinoFamily, we are pretty adventurous when it comes to food, we love to try out new recipes and DinoBoy is willing to eat any suspicious looking new dishes we put on the table. He will try it with little or no protest then give his sometimes too honest view of the food after the first bite. In May earlier this year, I challenged myself to cook dinner daily for the family, I searched intensively for some simple or quick & easy recipes and for the 1st time I used fresh milk in the white fish stew I whipped up at that time. It was well liked by the boys. I have been in love with milk recipes ever since. Besides, my attempt with Jamie Oliver’s Chicken in milk recipe was a hit with the DinoFamily. When the good people in Greenfields approached me to do a review of their milk, I jumped at the chance almost immediately. Don't get me wrong, I did not accept it just because its complimentary milk, I grabbed this chance as I know, and I'm sure many of you know this too, Greenfields produces milk that has no additives, chemicals, antibiotics and hormones added to their milk, that's why they can claim that they produce Honest Milk. 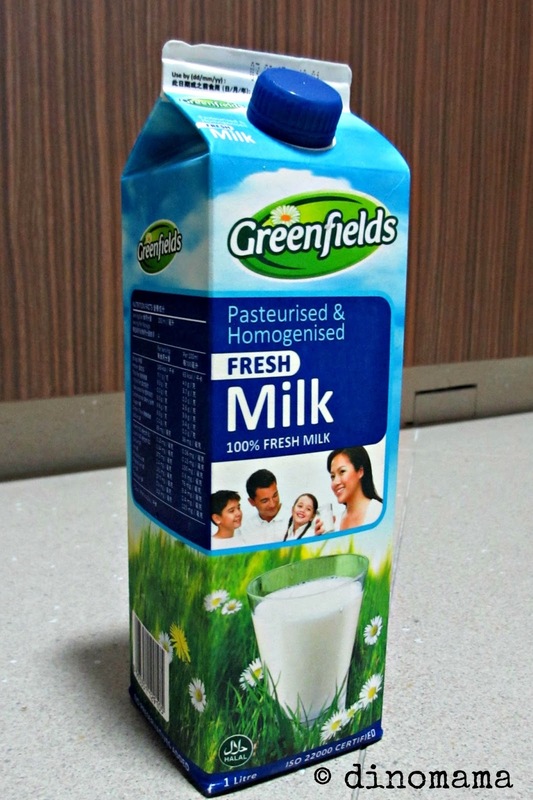 Greenfields Milk is from Indonesia and has been established since 1997. They have an integrated dairy farm based at Gunung Kawi, Malang, East Java with over 6,000 Holstein cows which produces over 20 million litres of fresh milk each year. Their milk is produced, pasteurised and packed within the dairy and it is single-pasteurised, ensuring optimal freshness till it reaches our doorstep. 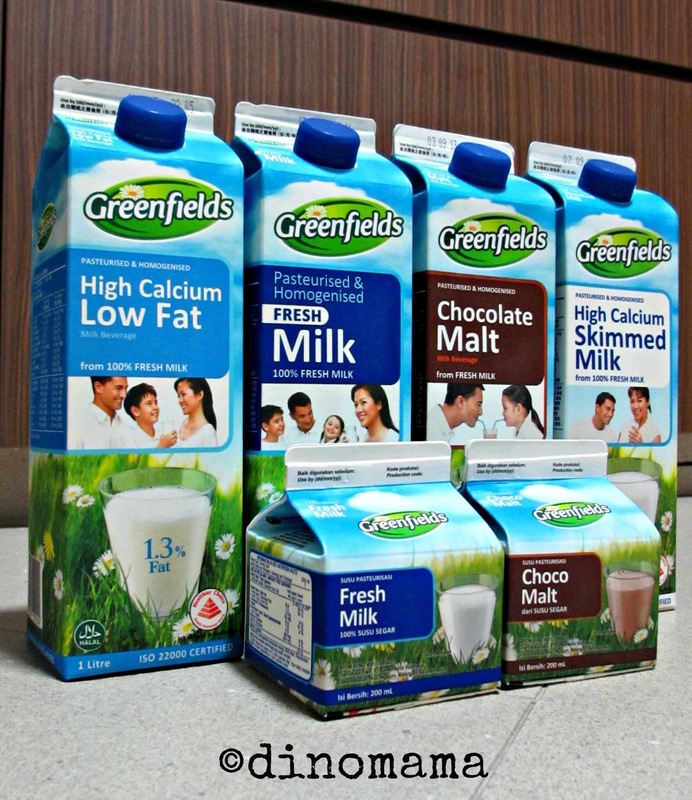 Greenfields milk is also available in countries like Indonesia, Malaysia, Hong Kong and Philippines too. Before I received the Greenfields milk, I was already searching excitedly for a new recipe to try with the milk. I decided to go with salmon; a fish that I only love when its raw, will tolerate if its smoked, but DinoPapa & DinoBoy love it a lot. I decided that I should indulge them with both the goodness of the salmon AND the milk. I found this simple recipe and it took me only 15mins to get it done using the oven. We were seated at the dining table enjoying the salmon shortly after. The mouthwatering smell of the baked salmon gushed out from the oven the minute I opened it made my stomach growl almost immediately. The vibrant colors looked inviting and appetizing when I got it out from the oven. A tantalizing dinner awaited us! One important thing to note when you make this dish, you have to use full cream milk, not skim nor low fat, you need the milk fat in this recipe. And yes, even I enjoyed it a lot. The salmon was baked to a soft and tender texture. The combination of milk, cream cheese, lemon rind and spice made it tasty while the soft vegetable added some sweetness to it. I enjoyed it so much that we made this 2 days in a row! We had the salmon with rice on the 1st night and with pasta on the 2nd night. The DinoFamily felt that we could have the salmon fillet alone with perhaps a side dish of mashed potatoes and more vegetables. 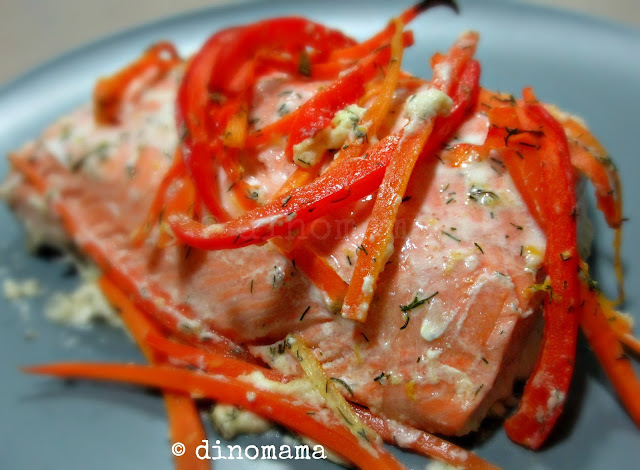 For all the salmon lovers out there, I'm sure you will love this. For those like me, try out this recipe and let me know if you love it like I do. Till the next post, happy cooking! 1. Preheat oven to 375 °F (190 °C). 2. Lightly butter 13 x 9-inch (33 x 23 cm) baking dish. 3. 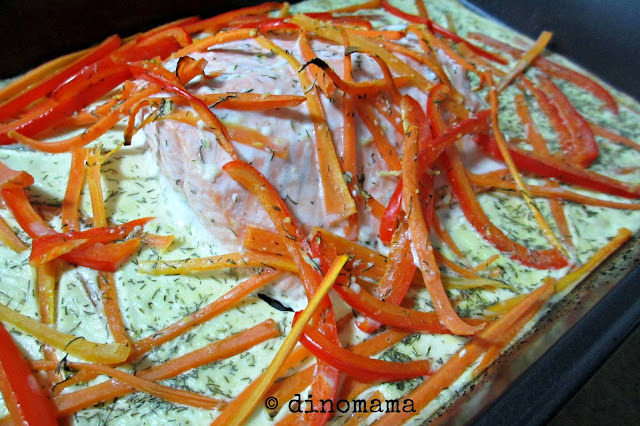 Place salmon in baking dish, leaving about 1 inch (2.5 cm) between fillets. Sprinkle carrots and peppers over and around fish. 4. In bowl, using electric mixer, beat flour and Cream cheese until smooth. 5. Gradually beat in milk, then lemon rind, dill, salt and pepper. Pour over salmon and vegetables in dish. 6. Bake, uncovered, for about 15 min before serving. 7. Remove salmon from dish with a pancake flipper, spoon vegetables and sauce over top. 8. Serve sprinkled with lemon juice. Disclaimer : I received few cartons of milk from Greenfields for purposes of this review, though I was compensated for this post all opinions are 100% mine. All photos in this review are taken by me painstakingly so they naturally belongs to me. Be nice and do not "steal" them. That looks delicious. I wish that I could get my kids to eat salmon. thanks for the great idea for a salmon recipe!!! wow! I do not eat Salmon, but this is a recipe that I'll definitely try for my husband, I know he will enjoy it very much! I pinned in my recipes board! Thank you for sharing.